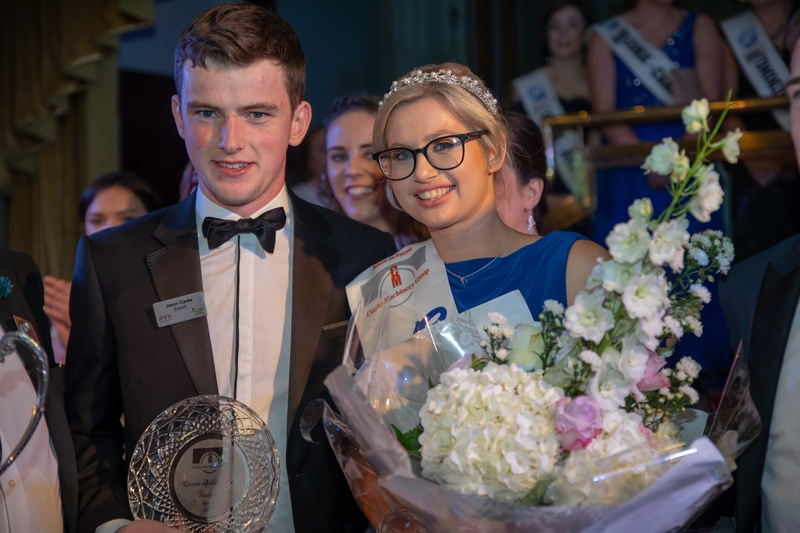 Limerick woman Louise Crowley has been crowned the 54th Annual Clarke Machinery Group Queen of the Land 2018 at a glittering gala ball in Tullamore. Louise came out on top of 30 Queens by impressing the judges with her personality, her passion for her farming work and connecting with her local community. In 2nd place was Aisling O’Driscoll from Muskerry – Cork (Terelton) while Roisin Lynch from Ramor, Cavan was announced in third place. The weekend saw 30 Queens descend on the Bridge House Hotel, Tullamore early Friday morning. They headed off on a tour around the faithful county, calling to Clonmacnoise and the Tullamore Dew Heritage Centre. After the official opening that evening, the Queens took part in an open forum discussion with a panel of well-known women and men in the farming industry before heading to the Palace Nightclub for a night of dancing with country music sensation Marty Mone. On Saturday morning, the girls were up early for interviews with an esteemed judging panel of Gerard Clarke, Managing Director of Clarke Machinery Group; Emma Birchall, reigning 2017 Queen of the Land; Anna Marie McHugh, assistant managing director of the National Ploughing Association; and Joe Healy, president of The Irish Farmers Association. Each queen was then greeted by their escorts in Hugh Lynch's, with the lads then put through their paces in an interview with Rock on Paddy, one of Offaly’s well-known entertainers. On Saturday night, after the Queen’s onstage interviews, the crowd was entertained by Transmitter, the Groomsmen and Joe Wynne until late. Sunday saw the hosting of the Gala Banquet where the dancing was interrupted at midnight on Sunday night when the winner was announced. Louise Crowley was then presented with the Queen of the Land Linda O’Brien tiara, the Clarke Machinery Group sponsored perpetual trophy, the Clarke Machinery Group sponsored €1,000 prize, a specially commissioned piece of Galway Crystal from Cahill Jewellers, a two-night break in the Bridge House Hotel and a €200 clothing voucher from Kode Clothing. Both runners-up received a €200 cash prize and a specially commissioned piece of Galway Crystal. clothing voucher from Guy Clothing and a prized Gold Card for Copper Face Jacks, Dublin. Chairman, Ger Mahon, commented after the glittering event. “We, the committee, are delighted to see Louise crowned the 2018 Clarke Machinery Group Queen of the Land. We are sure she will do a great job of representing our Festival all over the country for the next year." Birchall, leave her role as well as she has done a superb job throughout her reign," he added. "With another Festival closing, I am most grateful to all the hard working committee, all our generous sponsors and most of all to our supporters, who came from all over the country and further afield to enjoy the Clarke Machinery Group Queen of the Land Festival 2018," Ger concluded.